A Young Girl Was STILL Alive While Giving Her a Burial Ceremony! Have you watched Nora Aunor's famous movie Himala and her famous line, "Walang himala! Ang himala ay nasa puso ng tao!" (There is no miracle! The miracle is in the hearts of men!)? Netizens encounter many stories on the internet that are unbelievable and weird. Moreover, the social media has its big role to share different stories to others. Among those stories that most of us have read are stories of resurrection, which are more likely to consider as a miracle. 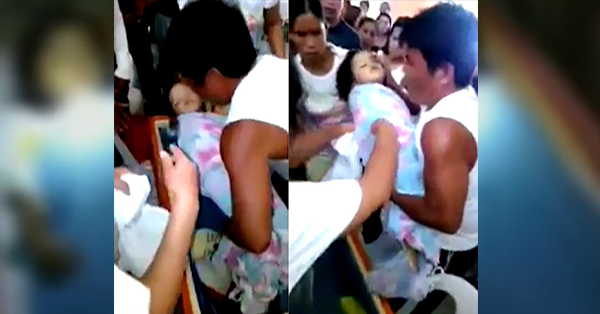 There was a young girl in Aurora, Zamboanga del Sur who was declared dead by a doctor. However, everyone was surprised that the girl was brought back to life while she was having a burial mass. Base of the spectators, while the body was about to be given a blessing led by the priest, the little girl promptly moved its head the time the cover of the coffin was removed. They immediately brought the girl back to the hospital where she was pronounced dead, but nothing took place because the doctors who handled the patient insisted that the girl was no longer alive that time. The parents were thinking to bring her to a more extensive hospital affirming that the girl is still alive.